#VeereDiWedding Actor #SumeetVyas is getting married to popular television actress #EktaKaul in Jammu. The pictures from the wedding ceremony are breaking the internet! A lovely click from the Sangeet ceremony has been shared by their official wedding photographer on social media. In the photo, the duo looked deeply in love. 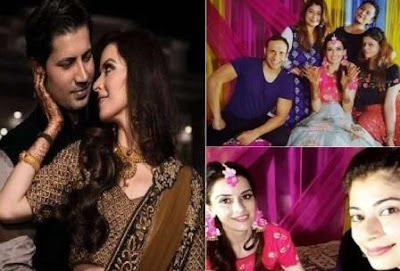 Actors Sumeet Vyas and Ekta Kaul are all set to tie the knot today in Jammu. While everyone is waiting for the beautiful couple to walk down the aisle, we have got our hands on their photos from the pre-wedding rituals. Sumeet and Ekta’s wedding will take place in Jammu, as it is actress’s hometown. The duo has been dating and courting for the longest and now finally they are getting married! A few pictures from the Sangeet ceremony are doing rounds on the internet. The duo is looking absolutely in love and adorable! Sumeet Vyas has featured in web-series Permanent Roommates and TVF Tripling. The actor has also featured in films like Parched, English Vinglish and Ribbon to name a few. Ekta Kaul is a television actress, who debuted in TV show Rab Se Sohna Isshq and she was last seen in Mere Angne Mein.